You are here: Home / Rules / Pickleball Court Size — What are the Dimensions of a Pickleball Court? I love the following scene from the 1986 film, “Hoosiers.” If you recall (and if you don’t recall, rent it or buy it from Amazon), Hoosiers is a 1986 sports film about a small-town Indiana high school basketball team that wins the state championship. The story is set during 1951/1952, when all high schools in Indiana, regardless of size, competed in one state championship tournament. In the following iconic scene, the coach demonstrates that, regardless of the size of the venue or arena, the court dimensions will always be identical — with the free throw line always set at 15 feet from the basket and the height of the basket always 10 feet from the floor. 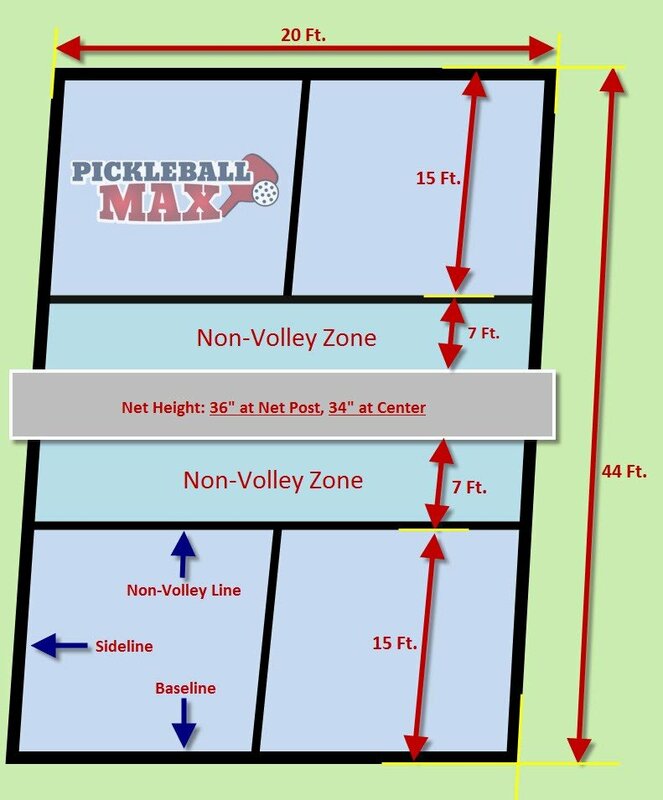 The official pickleball court is a rectangle with dimensions equal to 20 feet wide (inclusive of lines) by 44 feet long (inclusive of lines) for both singles and doubles. The non-volley line is the line on each side of the net between the sidelines and parallel to the net. These lines are located 7 feet from the net. The non-volley zone is the area of the court bounded by the two sidelines, the non-volley line and the net. The net is 36 inches high at the sidelines (at the net post) and 34 inches high at the center of the court. Net posts should be placed outside the sidelines. Recommended placement is 12 inches from the sideline. Look forward to seeing you on the pickleball courts — and if you build your own backyard court, please invite me to play!